While Microsoft Edge, Google Chrome, and Mozilla Firefox frequently make the news and get all the attention, Opera’s eponymously-named web browser is often forgotten. Opera puts plenty of customization options at your disposal, allowing to change the way the browser looks and thus make it fit your own personal tastes. But the one customization option that stands out is animated themes. Featured above is just one of many animated themes you can add to the browser. You can access them from Opera itself or from Opera’s add-on catalog. Opera for computers, Opera for Android, Opera Mini, Opera Max and Opera Coast, they all use data compression technology to speed up slow connections and help you save data. Known as Opera Turbo or Off-Road Mode, this technology compresses data and shrinks the web content you want to access, be it text, photos, and even videos. The browser will load faster and will use up less data. If you have a powerful flagship, you don’t need to worry about storage space. If you don’t, and you have to use storage space wisely, then you need to know that Opera for Android can make webpages look like apps. You don’t have to install apps on your Android and thus waste precious storage space, you can use web apps instead. 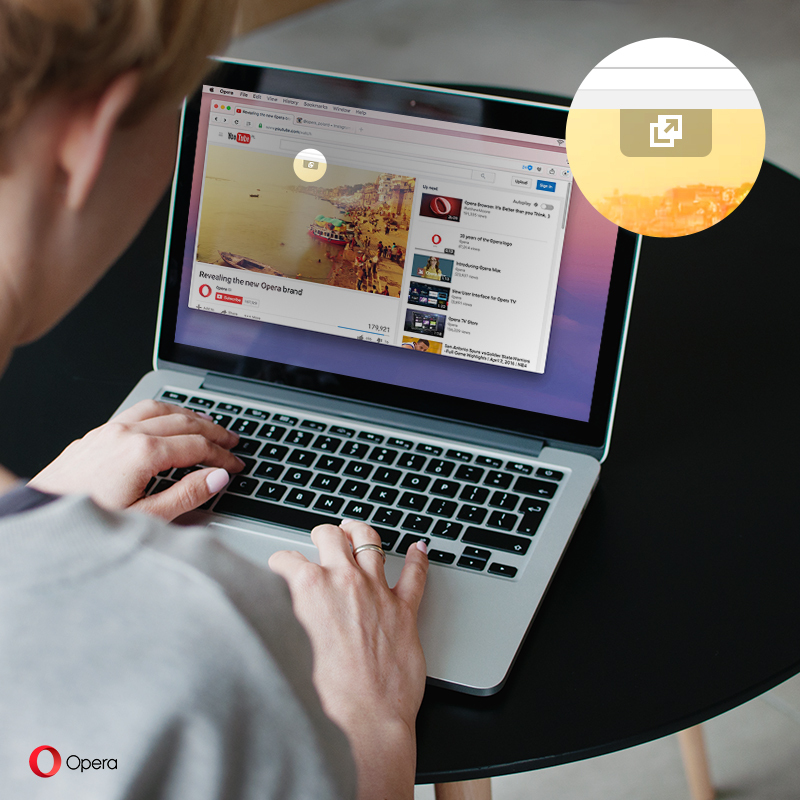 By singing up and signing into your Opera account, you can sync your bookmarks across all your devices. The websites you bookmark using Opera on your desktop computer will be synced with Opera on your smartphone, for example. The sync feature also works with your tabs, Speed Dial, settings, browsing history, and passwords. Click the News button from the left hand side and Opera will display news related to a variety of topics: gaming, technology, health, sports, and more. Check the News option and Opera for computers will display news right on the start page. Obviously, you get to pick which topics are of interest to you. Opera for Android has a similar feature, just that it’s called Discover. It brings you the latest news, tech, sports and other content from world-leading magazines and newspapers. Every major browser provides support for extensions. Well, every major browser except for Microsoft Edge, which is still working on this bit of functionality. Opera too provides support for extensions. What’s even better, it comes with sidebar extensions. “Sidebar extensions are little tools you can add to the left side of your browsing window. They let you to multitask without leaving a tab!” explained Opera’s Angela Wang. Because ads are annoying, distracting, and sometimes even dangerous, Opera decided to give its browser native ad-blocking capabilities. This makes Opera the first major PC browser that features integrated ad-blocking technology. The ad-blocking feature isn’t ready for the general public just yet, but it’s getting there. The feature was introduced early this March, when it was available in Opera Developer for desktop. By the end of the Month, it had already graduated to Opera Beta. I’m confident it will make its way to the stable version of Opera pretty soon. Click a button, this button, and the Opera web browser will pop videos out of the webpage. So if you want to watch a YouTube video, but you don’t want to stay on YouTube.com, you can use this feature to pop the video out. Once you do that, you can place the video anywhere you want on your computer’s screen. screen. “This feature is based on HTML5 technology – we provide the functionality for content embedded in the <video> tag. This means that (hopefully) soon-to-be deprecated plug-in-based technologies, such as Flash or Silverlight, are not supported,” explained Opera’s Aneta Reluga. Introduced mid-April, this feature went straight to Beta. It skipped Opera Developer and went straight to Opera Beta. About 11% of all computer users are still on Windows XP, even though mainstream and even extended support for the operating system ended. Microsoft no longer supports Windows XP and neither does Mozilla Firefox or Google Chrome. Google just recently dropped support for Windows XP; it happened earlier this month, when Google released Chrome 50 to the public. It doesn’t matter why you’re still on Windows XP. Perhaps you refuse to use anything else, perhaps you’re stuck using this obsolete operating system. What matters is that Opera continues to support it. So if you can’t or don’t want to give up on Windows XP, you should definitely switch to Opera. If you’re one of the 270 million people who have upgraded to Windows 10, then you need to know that Opera went to great lengths to make the browser look great on Microsoft’s latest operating system. Download Opera for Windows and Opera for Mac right here on FindMySoft. Download Opera for other platforms, such as Linux, Android, and iOS, straight from Opera.com. Get started with Opera Beta here.